For the skier who often struggles to find shoes that are wide enough. Typically buys EE or EEE footwear. Commonly seen with a high arch. While this type of foot provides a stable platform in can cause cold feet as well as numbness if not properly fit. Apex has designed this boot for skiers of all abilities. The combination of comfort and performance while staying warm will allow you to enjoy the slopes all day long! Custom fit, flex and cuff alignment allows for personalized adjustment to your natural foot position. - All Mountain Performance “Open Chassis™” design. - Heat moldable inner liner. - Ergonomically designed cuff, built for a ladies' lower calf structure. - Tunable A-Flex Suspension™, cuff alignment, and micro adjustment buckles. Pros: Great boot for all ability skiers, very comfortable. 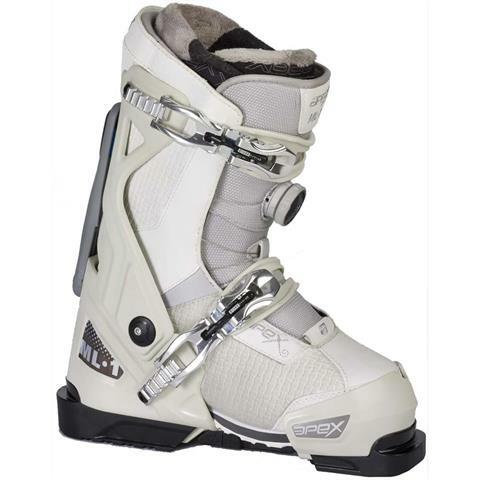 Great boot that can work for all ability skiers. Great for people with wider feet that have trouble fitting in to smaller, more narrow boots. Very comfortable!